Introduction: Mononeuralgia is a notoriously difficult condition to treat. Mainstays of therapy are neuropharmaceuticals and neurosurgery. We describe the treatment of two very different patients with different neuralgias both treated with Neural Prolotherapy an adapted Prolotherapy technique. Case description: Patient #1 is a 63 year old Hispanic female complaining of 13 years of burning pain of the face and scalp due to V1 branch trigeminal neuralgia after neurosurgical intervention for cerebral aneurysm. After three treatments with Neural Prolotherapy she reported complete resolution of pain. Patient #2 is a 61 year old Caucasian female complaining of acute on chronic lateral leg pain due to meralgia paresthetica. After eight treatments with Neural Prolotherapy she reported significant reduction in her pain and elected to forgo any further treatment. 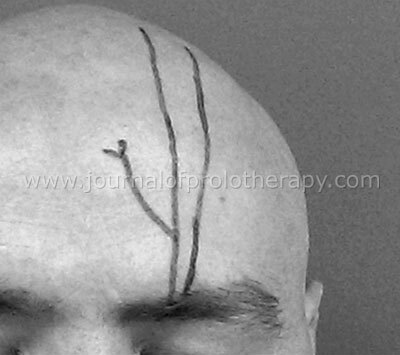 Technique: Neural Prolotherapy is a technique in which subcutaneous tissue is injected with a 5% dextrose solution. Neural Prolotherapy was performed for both of these patients by injecting tender points in the subcutaneous tissue along the affected nerve paths, V1 and lateral femoral cutaneous nerves respectively, with approximately 0.5mL of D5W at each point at a 45 degree angle 1-2cm apart. The needle was inserted 0.5-1cm deep and the solution was injected while withdrawing the needle to create a skin bleb. Conclusion: Neural Prolotherapy is a simple office procedure, easily done without imaging, and may lead to relief from neuropathic pain. The most common side effects reported were temporary pain with injection and local bruising. The proposed mechanism of action is agonism of TRPV1 receptor. There is clinical trial data reporting use of this technique for Achilles tendinosis and we hypothesize that this technique could be employed for a variety of peripheral neuralgias. Mononeuralgia is pain along the distribution of a single peripheral nerve. Single nerve neuralgia is often caused by compression or other damage to the nerve, although in many cases a specific cause is not apparent. In instances where a structural cause is identified and corrected, patients may continue to experience pain in the affected nerve due to facilitation. This paper will discuss Neural Prolotherapy as a potential treatment for mononeuralgia by demonstrating cases of successful treatments for trigeminal neuralgia and meralgia paresthetica. Meralgia paresthetica is a neuropathy of the lateral femoral cutaneous nerve usually caused by intermittent entrapment. The estimated rate of occurrence in the United States is 3 cases per 10,000.3 It is commonly associated with obesity, diabetes mellitus, and pregnancy, due to the overhanging of a large abdomen.4 Weight loss and looser fitting clothes can help relieve pain if implicated in the contributing cause. Medications used are similar to those prescribed for trigeminal neuralgia. In some severe cases, surgical intervention is considered. Despite their different anatomical locations, patients with trigeminal neuralgia and meralgia paresthetica generally report the same neuropathic type pain such as burning pain or electrical sensation and numbness or tingling of the innervated area. Neural Prolotherapy is a simple, minimally invasive technique that can be performed in any primary care office to help alleviate the pain of neuralgia. This physician injected tender points in the subcutaneous tissue along the path of the affected nerve in each case. These were identified based on knowledge of anatomy and the patients’ area of reported pain. 3mL syringes with a 0.5 inch needle were prepared with a solution of 5% dextrose in water (D5W). The tender points were each injected with 0.5mL of solution, at a 45 degree angle, 0.5- 1cm deep and approximately 1-2 cm apart. The solution was injected while withdrawing the needle so as to create a skin bleb. The interval between treatments varied and was as short as 1 week and as long as 3 months apart. For simplicity, readily available premixed 5% dextrose in water (D5W) supplied in 250cc bags intended for IV piggyback was used as the injection solution. Certainly 50% dextrose, could be diluted down with sterile water to a 5% concentration. A 63 year old Hispanic female was referred to the office for osteopathic evaluation and treatment for chronic neck and head pain. Among other somatic complaints, her history revealed 13 years of burning pain on the left side of the forehead and scalp. The pattern of her pain followed the V1 nerve path. The pain began after undergoing two neurosurgical procedures to repair a cerebral aneurysm. The specifics of her surgical procedures were not obtainable as they were performed in another country and she did not have access to her medical records. She reported pain even to light touch of the affected areas of the scalp and was often unable to brush her hair due to the pain it caused. She had tried over the counter analgesics and tramadol-acetaminophen with little relief. She was initial treated with osteopathic manipulation which provided symptomatic relief for a few hours. She was hesitant to try additional medications due to their side effect profile. Comorbid conditions included: hypertension, dyslipidemia, and non-insulin dependent diabetes. Figure 1. Supraorbital nerve is a branch of the V1 ophthalmic division of the trigeminal cranial nerve (CN V). It passes through the supraorbital foramen to innervate the forehead, extending to the mid scalp. After three treatments with Neural Prolotherapy she experienced complete resolution of her V1 branch trigeminal neuralgia. At the point of the submission of this paper 1 year had passed without the return of pain. She reports the ability to brush her hair without pain and overall improvement in quality of life and her ability to perform activities of daily living. She continues to seek occasional osteopathic manipulation for cervicalgia, but continues to report her neuralgia as completely resolved. A 61 year old Caucasian female presented for osteopathic evaluation and treatment of acute on chronic right leg pain. She reported years of intermittent right lateral upper leg burning and electrical shock type pain due to meralgia paresthetica and her pain pattern followed the typical lateral femoral cutaneous nerve pathway. On her initial presentation for this exacerbation she reported that the pain was now constant and more severe than her previous intermittent pain. She expressed discomfort with prolonged sitting and standing and needed to frequently change positions. She had had prior temporary relief with local steroid injection. Comorbid conditions included: hypertension, hypothyroidism, hyperlipidemia, esophageal reflux, impaired fasting glucose, and allergic rhinitis. Other contributing factors included a sedentary office job and obesity. She had also previously undergone four intra-abdominal surgeries, the most recent of which was 18 years prior. She received temporary, partial relief with osteopathic manipulation. Figure 2. The posterior branch of the lateral femoral cutaneous nerve passes through the tensor fascia lata to innervate the skin of the lateral thigh from the greater trochanter to just above the knee. After eight treatments with Neural Prolotherapy, she reported that she still had an occasional sensation of numbness in a small area of approximately 2cm of her leg but that it was no longer painful and did not prevent her from conducting any of the activities that she wished to perform. Although her symptoms were not 100% resolved, she was satisfied with her pain relief and improved quality of life and therefore chose to discontinue her treatment. This adapted technique of Neural Prolotherapy was first introduced in the literature by Lyftogt in his 2005 Achilles tendinosis pilot study. He described injecting tender points in the subcutaneous tissue alongside the affected tendon as a treatment for painful Achilles tendonitis.5 This was a departure from the traditionally described Prolotherapy in which a more concentrated proliferant is injected directly into the enthesis of an affected structure.6 Traditional Prolotherapy causes discomfort and increased pain at the time of injection and in the immediate following few days. As this alternate approach merely involves injection into the subcutaneous tissue and with a lesser gauge needle, there is significantly less discomfort for the patient. In both of these studies the solution used was 20% glucose/0.1% lignocaine/0.1% ropivacaine6 whereas 5% dextrose in water was employed in the patients in this report. Weglein reported his experiences and four case examples of treatment with Neural Prolotherapy in 2011.7 His patient complaints included: rotator cuff tear, low back pain, and knee pain. His technique varied slightly from patient to patient as in some instances he employed Prolotherapy and Platelet Rich Plasma (PRP) as a part of his treatment regimen.7 Like Lyftogt, his patients reported resolution in their pain. The studies by Lyftogt and Yelland as well as the Weglein’s cases are the only reports of this technique in a 10 year literature search. Traditional Prolotherapy yielded more reports but employs a different technique and was therefore not included in the literature review. Employment of Lyftogt’s novel approach to Prolotherapy resulted in lasting relief from pain due to V1 branch trigeminal neuralgia and meralgia paresthetica in the first and second cases respectively. Lyftogt recommends weekly injection until resolution of pain. Neither of these patients had a schedule permitting treatment that frequent, however they both reported resolution or reduction in symptoms and were satisfied with their treatment results. Temporary injection site tenderness and bruising were the only reported side effects by either patient. As with the Achilles tendinosis trials and Weglein’s cases, the affected nerves in these cases were both relatively superficial and therefore easily accessed with a short needle. A potential limitation may be that deeper affected nerves in other neuropathic processes could be more difficult to target due to location. Additionally, neither patient had electromyography (EMG) confirming their diagnosis, as their symptoms were clinically classic for their respective conditions and it was felt that this invasive testing would not alter the treatment course. In these cases Neural Prolotherapy was performed in a primary care office without imaging guidance. Nerve pathways were identified based on knowledge of anatomy and palpation for areas of the patient’s tenderness. It is our conclusion that there is the potential for Neural Prolotherapy to be utilized in any neuralgia of an accessible peripheral nerve. As the technique is minimally invasive with a low side effect profile, it could be considered prior to surgical intervention and perhaps even before long term pharmacotherapy is initiated. 1 Singh M, et. al. Trigeminal Neuralgia. Medscape. http://emedicine.medscape.com/article/1145144-overview#a0156. Updated September 24, 2013. Accessed April 20, 2014. 2 Trigeminal Neuralgia Information Page. National Institute of Neurological Disorders and Stroke. November 26, 2013. 3 Luzzo C. Physical Medicine and Rehabilitation for Meralgia Paresthetica. Medscape. http://emedicine.medscape.com/article/308199-overview#a0199. Updated May 10, 2013. Access April 20, 2014. 4 Meralgia Paresthetica. Accessed November 26, 2013. 5 Lyftogt J. Prolotherapy and Achilles tendinopathy: a prospective pilot study of an old treatment. Australas Musculoskel Med. 2005;10:16-19. 6 Yelland M, et al. Prolotherapy injections and eccentric loading exercises for painful Achilles tendinosis: a randomized trial. Br J Sports Med. 2011;45:421-428. 7 Weglein, AD. Neural Prolotherapy. Journal of Prolotherapy. 2001;3(2):639-643. 8 Rosen H. Minimally invasive Prolotherapy. The American Osteopathic Association Prolotherapy Integrative Pain Management. 2012 Spring Training Seminar. April 14, 2012, 8am. Naples, FL. 9 Cui M, et al. TRPV1 receptors in the CNS play a key role in broad-spectrum analgesia of TRPV1 antagonists. The Journal of Neuroscience. Sept 2006;26(37):9385-9395. 10 Robago D, et al. Prolotherapy in primary care practice. Prim Care Clin Office Prac. 2010;37:65-80.